He was in extreme pain after jamming his hand while fielding at the boundary. The Mumbai Indians team is concerned over their form at their own home after the defeat at the hands of Rajasthan Royals in the ongoing IPL 2019. Jos Buttler’s brilliant innings of 89 in 43 balls made short work of MI’s target of 188 runs to win, as RR romped home by 4 wickets. Though Mumbai Indians’ batting clicked big time in this match, as Quinton de Kock slammed 81 and captain Rohit Sharma made 47 with Hardik Pandya again providing death overs fireworks with 28* in 11 balls; their bowling was something that will have Rohit Sharma and coach Mahela Jayawardene a bit concerned. 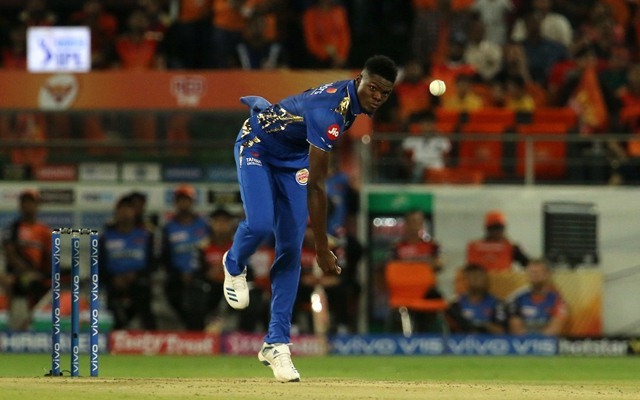 Their star bowler Alzarri Joseph, who had picked an IPL all-time best bowling figures of 6/12 against Sunrisers Hyderabad in his debut, went for 53 runs in just 3 overs with an economy of 17.66. He experienced the distant spectrum of T20 cricket with applause in one match to distraught in another match within days. The Mumbai-based franchise will take on a resurgent Royal Challengers Bangalore, who recently won their first match this season after six losses. However, they are likely to dealt with a huge blow ahead of the game. The Antiguan fast bowler Alzarri Joseph suffered a shoulder injury to his bowling arm, as he jammed his hand into the turf while trying to stop a ball. He is likely to get ruled out of the tournament according to the reports in ESPNCricinfo. Apart from Joseph, Quinton de Kock also didn’t take the field after his batting innings, as he felt dehydrated and instead, Ishan Kishan kept wickets for the MI team during Rajasthan’s batting. “It was very hot and he (de Kock) had batted for long. So, it was a case of just some dehydration. He should be fine before the next game,” Ishan said during the post-match presentation.